I love cooking ahead of time to make dishes that not only taste delicious, but also make me feel good. This weekend we made Asian Chicken Soup because it's super healthy, the kids love it, I know it will ward off any sick germs lurking around and I can double it for another day this week. 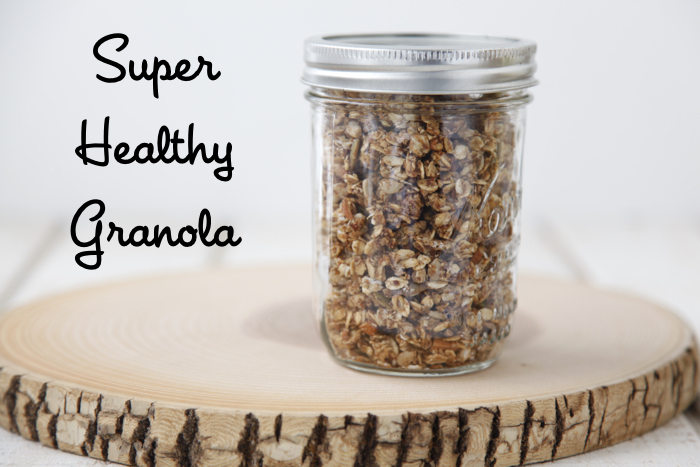 When it comes to make ahead recipe for breakfast and snacking I reach for all the nutritionally dense ingredients in this Super Healthy Granola. I've been making it for years and putting it in glass jars to keep in the pantry to serve with milk, on top of yogurt in parfaits and to grab and go when we're needing a little something special as a pick-me-up. One of my favorite tricks for this Super Healthy Granola is to let it sit for an hour or so until it's totally cool after baking so you can break it into big chunks that turn out almost like granola bars. Each bite has a nutty taste with just enough spice to make it addictive to adults and kids. When you're trying to figure out what to make to get you on the right path to health this January you'll be glad you made a big sheet pan of Super Healthy Granola! 2. Place all of the ingredients in a large bowl and stir well to combine. 3. Spread onto one large (or 2 small) cookie sheets lined with parchment paper and bake for about 1 hour and 15 minutes or until golden brown. Allow to fully cool before stirring and transfer to a storage container. Looks yummy! Can I replace the oat bran with another cup of oats? Or just leave it out? You can leave it out if you prefer! This looks great - can't wait to try it tonight! I prefer wheat germ over oat bran, can I substitute? That substitution should be fine! I'm super lazy and don't want to make this. Can you send me some? Michaela, if you have some spare mason jars, I could definitely do this! They'd make great grab-and-go breakfasts! Hi - This looks great. We are a nut free house. Do you have any replacement suggestions for the almonds and walnuts. Thanks so much. I am personally okay with almonds (which aren't actually a nut) but am allergic to walnuts, I will be replacing the walnuts with cashews and or pistachios (both of which are also not nuts). If you can't do that, you could add extra of the seeds to make up the difference. Or add something like quinoa. Fantastic recipe. Thank you for sharing. 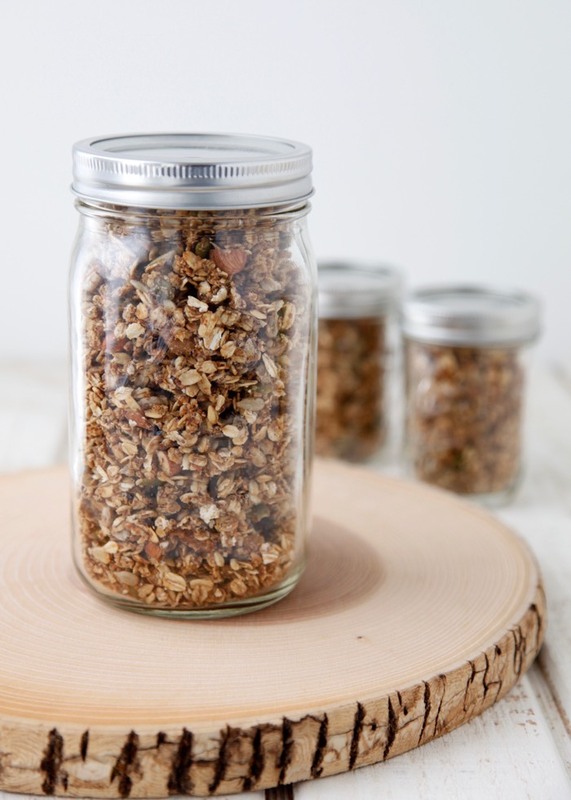 How long will the granola last or stay fresh in the mason jars? If I cut the honey in half to reduce sugar, would it still hold together well enough? Do you have calorie info for a serving? Thanks. 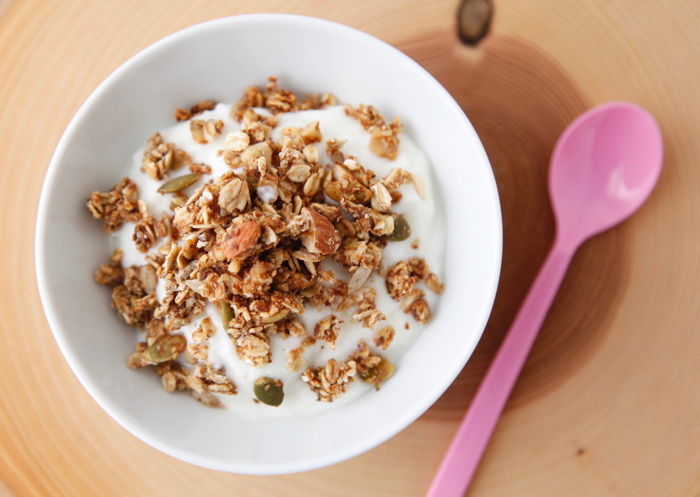 How long will the granola last in the pantry? 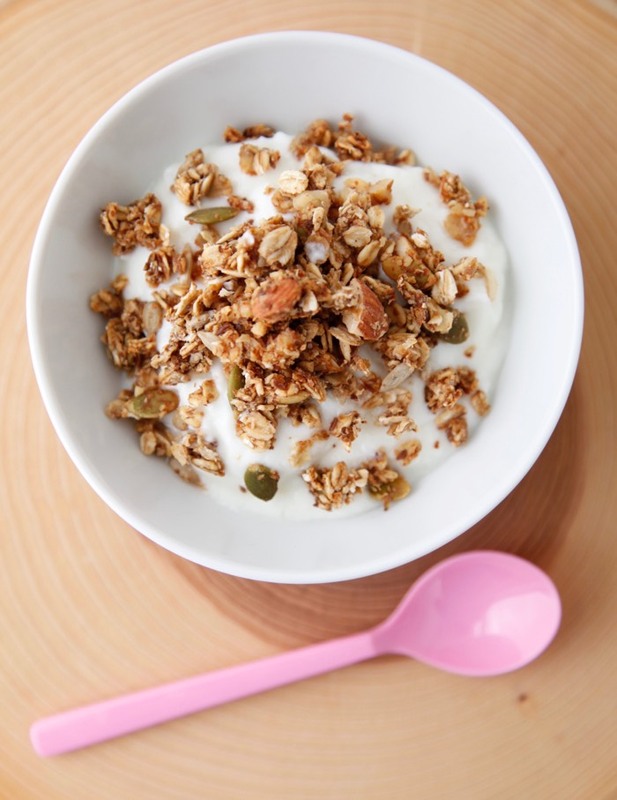 Can you still make this granola with roasted nuts and seeds?? I appreciate the written recipe shows it is Egg-Free and Dairy-Free, but I really would like to have the Nutrition information as well. Calories/Protein/Carbs/Fats/Carbohydrates/Sodium would be helpful. Thank you. Hi, I've made this and its very delicious, we all love it. I would like to make more things with oat bran and wheatgerm, do you have any more recipes or suggestions for use?